Social Darwinism is the idea that even as humans moved from more treacherous surroundings to civilization, they interact in ways that make certain characteristics and behave more likely to survive than others. Cornell professor Robert Frank wrote about the economics that arise out of such interactions in his book “The Darwin Economy.” If we choose to view the world in this manner, we can use evolutionary game theory as a network concept to analysis the survival or the demise of certain behaviors. This is especially true in situations where individual benefit diametrically opposed to the society’s well-being. In his analysis, he notes that markets do nothing to regulate such behavior, and this is a type of welfare failure that markets don’t regulate. Suppose most people are Show-offs, i.e. a large population of Show-offs exists. If you introduce a small fraction x of M types, the expected payoff for S types is: (1-x)*(1) + 5x = 1+4x. The expected payoff for M types is (1-x)*0 + 3x= 3x. Over time, the S do better than the M, and M are extinguished (or just move elsewhere!) The S types fare better than the M types, so being a Show-off is evolutionarily stable. Now, suppose that the large population consists of Modest types, and we introduce a small fraction x of S types. The expected payoffs for S types is: (1-x)*(5) + x = 5-4x. do better! Being Modest is not an evolutionarily stable behavior. where T > R > P > S.
If the population consists mainly of Defect types, and we introduce a very small fraction x of Cooperate types, then we have the expected payoff for Defect types as: P(1-x) + Tx. The expected payoff for Cooperate types is S(1-x) +Rx. The difference between the payoffs is (P-S)(1-x)+(T-R)x, which is positive. Therefore, the Defect types fare better. Being a Defect type is evolutionarily stable. If the population consists mainly of Cooperate types, and we introduce a very small fraction x of Defect types, then we have the expected payoff for Defect types as: T(1-x) + Px. The expected payoff for the Cooperate types is R(1-x) + Sx. The difference between the payoffs is (T-R)(1-x)+(P-S)x. This is also positive. This means that when we start with Cooperate types, the Defect types still do better. Thus, the Cooperate behavior is not evolutionarily stable. This way of framing social interactions shows us the tension that can sometimes exist between behaviors, at the cost of social welfare: what is good for the individual may not necessarily be good for society. 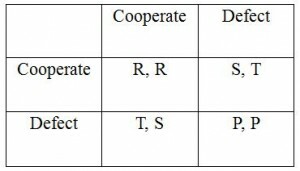 (By looking at the payoff matrix,we see that having interactions between all modest (Cooperate) types would make social welfare higher, but it’s not an evolutionarily stable result!) This game theoretic framework of social networks helps us understand why such behaviors persist.